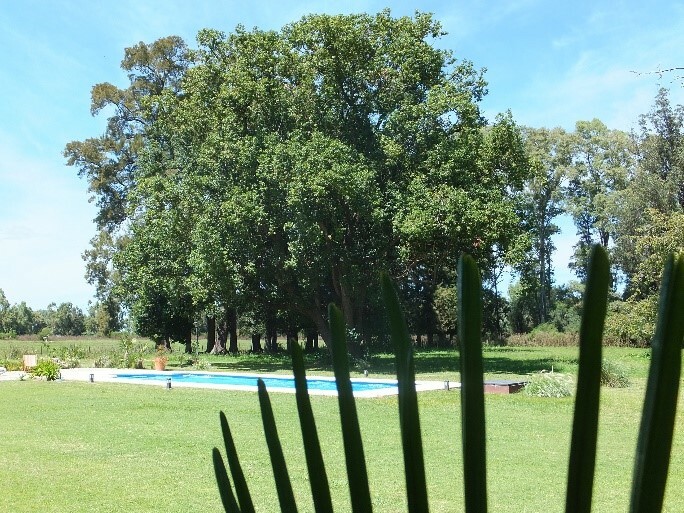 Argentina is known for its wines and cattle, but for us hunters it has much more to offer. This South American state has very different landscape forms such as parts of the Andes, glacial lakes and the pampas, traditional pastures of the famous cattle. This geographic location and landscape allows us hunters to take advantage of us and hunt a large variety of wild species. The areas around the Pampas offer red deer, Axischirschen and stag-goat antelopes (also called Blackbuck) an ideal habitat and are also perfect for the bird hunting game among other pigeons. The mountains in Patagonia, however, offer many other wild species such as pumas, multi-horn sheep, red deer, Peer Davids deer and more. Our group wanted to focus this time exclusively on the deer antelope and due to the very good stocks we had estimated for two days. Our group of four flew with a stopover to Buenos Aires (BA) the entry airport of almost every hunting trip to Argentina. Fortunately for us, the Outfitter had areas for stag-goat antelope or blackbuck near Buenos Aires, so we could save ourselves another domestic flight, which seemed like a present after 24h arrival via Rome. Arrived in BA the weapons formalities were done quickly and our outfitter Patricio was already waiting for us at the exit. After a warm welcome, it started immediately. The journey time is about 2 hours without traffic, but since Buenos Aires is busy day and night, the first part of the city was a bit stretched after that we could already enjoy the landscape of Argentina on the way to the lodge. 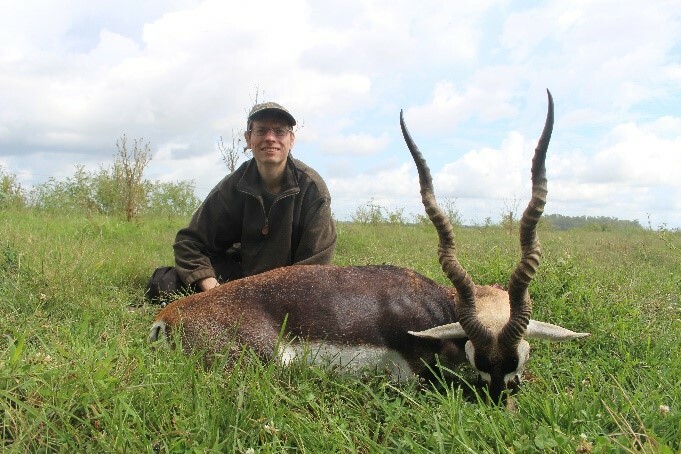 During the trip, we learned from Patricio that he hunts here several areas on which there are a total of about 5000 Blackbucks, but all completely in the wild. The habitat is ideal for the small antelope with alternating field forest corridor and in between small bushes and field crops. In addition to stag-goat antelopes, there are also strong ax-deer. Arrived in our lodge, which was still built in the typical colonial style, we discussed the hunt the next day with a rich dinner. We were to be led into two groups, Patricio went with me and Torsten along with Bernhard went with a second professional hunter. Already on the way to the hunting ground we could see the first small jumps of baking sticks, which gathered together with the here all-cattle in the pasture. The area consisted of many small groves, which bordered on a large pasture. Our plan was slowly to stalk through the small forest in the direction of the pasture, to get an overview of where the stag-goat antelopes are exactly. Although we stalked very quietly, we were able to make two groups of antelopes during our stalking through the small grove, but only female game, so we stalked purposefully further towards the pasture. Arriving at the field edge of the forest, we were able to identify two larger groups, which stood together with the cattle in the pasture. As there was no cover for us in the pasture we cautiously stalked the end of the grove and from there we crawled slowly over the cattle pasture past the cow dung directly towards the coveted wild species. From about 300m we could make out supposedly two good bucks in the middle of the herd, this should now apply our attempt. Since the cattle and Blackbok had meanwhile noticed something and regularly looked over to us, it now had to go very carefully. In the creeper we brought us to about 200m in firing position and to wait for the right moment to attach the shot. At first, none of the bucks did us the favor to move out of the herd and there were always either cattle or other blackbugs in the way, after waiting for 20 minutes, suddenly there was movement in the group and just before everyone jumped off one of the bucks stayed behind small bush stand, hoping to secure us. This was our opportunity and I was able to take the buck to about 180m. But when we got to the box, the surprise was big, the buck had only a complete horn and one side was stunted or broken. Since I had 3 stalks left I decided to shoot another buck, but this time shoot with 2 horns. After the obligatory photos we drove back to the lodge to supply the buck. 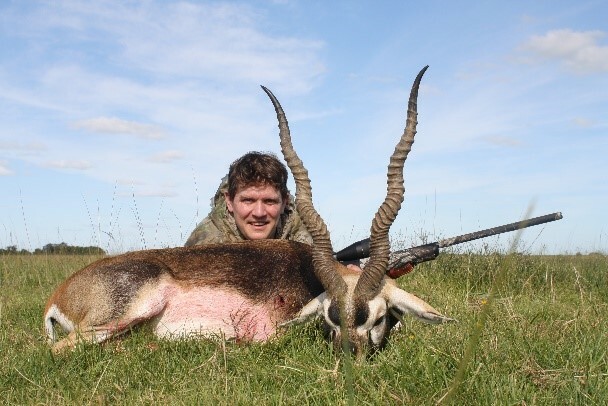 Once there we met already on our second group and could also wish Torsten waidmannsheil, because he could also kill a very good Blackbock in the morning. In the afternoon Torsten wanted to accompany me and film the hunt while Bernhard accompanied by another attempt to finally get his antelope antelope. Patricio wanted to drive this time in a slightly different area, here were much more forests and small parceled meadows available compared to the large pastures before. We took turns stalking the woods and meadows, seeing many Blackbucks but mostly females with younger or younger bucks. After about 2 hours of stalking, we reached a smaller grove with lake and saw stronger game in the distance, but the control with the binoculars showed us then that it was not a matter of blackbucks but a group of axi gras, including two very strong stags. Since neither Torsten nor I had planned an Axishirsch, we wanted to shoot only a few photos and then turn back to the stalking. We stalked until it was dark and saw some good bucks, but they were either too far or faster, so they could get to safety in time. Since it was too dark to respond, we drove back and could meet a happy Bernhard, this had now finally beaten his first buck. For the next day we agreed that he will try again for a second, as he would like one as shoulder mounting and one as cranial. On the second day we started after an early breakfast. Bernhard went with Patricio and Torsten and I with the second professional hunter. We wanted to go back to the area of ​​the day before with the many woods and small meadows. We stalked the small groves again and again and again looked at the field-forest borders, if we do not see Blackboks. The first hour did not go much, it was still early and the game was not much on its feet. But with the sun came movement into the forest and the field. At first we saw some pieces in our stalks in the forest, but mostly they were female pieces. We also managed to make two or three good bucks, but in the small woods we did not get close to the game, so we decided to focus more on the small meadows. After we had stalked for two hours and maybe saw 20 pieces, we suddenly saw outside of our forest strip, a larger group in which two very dark colored bucks were included. The bucks usually have a brown to almost black coat and thus stand out well from the group of brightly colored female. Slowly we stalked towards the group and could see with binoculars that one of the two bucks was a strong old Blackbuck. This should apply now. Carefully we stalked by using the trees to the edge of the forest. Luckily for us, the individual small meadows with cattle fences were fenced in but they were so overgrown that they offered a natural cover for us. We stalked our knees slowly along the fence and kept looking where the group was. When we were about 200m in front of the group, we could again confirm that it is a suitable goat and we decided to stalk another 40m, to a small wooden fence post, which offered an ideal edition. Said done after a short time we reached our place and I could set myself up. Meanwhile, a large part of the group, however, has settled down, including our buck which was exactly in the high graß. We could still see the horns, so we knew where he is, but the body was completely hidden, so that was not to think of a shot. After eternal minutes of waiting the group did the favor and they finished their midday rest and slowly got up again. Also our buck moved again and stood in the high grass, but still so that a shot was not possible. A short time later, however, he stepped in our direction in a slightly lower grass area and showed us the chest. For me, the only chance was now Spitz from scratch on the stitch, which I then also used and the buck was in the bang and a lot backwards in the tall grass. The rest of the herd jumped after the shot and we were able to see a very good buck, this time with two perfect horns. Overjoyed about the trophy and also that we had everything on camera we drove with the Blackbuck back to the lodge. There we already met the second group, they had also shot but the Blackbock jumped and they could not find him despite good drawing after the shot. Since we had to get to the airport early in the morning, we agreed that the second guide would look for a dog with a dog and that we should drive to the airport early. Early in the morning after breakfast we went back to Buenos Aires to the airport half way there then the facilitating call, with the help of the dog the guide found Bernhard’s second goat and it should be the strongest we had here during our two hunting days in Argentina. Satisfied that despite the short time here in Argentina everyone had received his coveted trophy, we made our way back to Germany on the long flight back via Rome. It was a great time for all of us, but there were two important things that we would do differently next time. On the one hand try to get a direct flight from Germany to Buenos Aires to save us the 24h flight with 8h stay in Rome and we would stay at least a day longer. Even if the 2 days were completely enough for the blackboks it would have been more relaxed to have an additional day as a buffer.